An invitation to a Pizza party is not something we are likely to turn down, but when combined with the pizzas being baked in a pizza oven made by the host’s very own hands, resistance is futile. Indeed this party was a double celebration, a birthday and a christening – if that’s what you call a baptism of fire for a pizza oven. Dough and toppings were already provided. All we had to do was roll out the dough to the size and shape we wanted and select our preferred toppings from a myriad of choices. as well as the usual range we were also offered wild garlic and steamed nettles. I had to have some of the latter, of course, so I have now eaten my very first nettle pizza! The oven was fantastic, and although it had to be fired up a couple of times during the evening, it managed to bake well over 40 pizzas. The photograph comes courtesy of the builder herself, Klaudia Vangool. I really couldn’t turn up empty handed and this party provided the perfect excuse to make – you’ve guessed it – a cake. I’ve used the Greek yogurt in my cakes a few times and am already finding it hard to conceive of not using it in my baking. It gives such a light consistency to the mix as well as keeping the cake nice and moist. Anyway, having come across this recipe for a butterless cake using sour cream at Cake Crumbs and Cooking, I of course thought of trying it with yogurt. Whisked 3 duck eggs with 125g dark brown sugar until thick and well incorporated (about 4 mins with electric whisk). Sifted in 115 g flour (1/2 white, 1/2 wholemeal), 1 scant tsp baking powder and 30g cocoa powder. Mixed together until just incorporated then poured into a 22 cm cake thingie and baked for 35 mins at 180C. Stirred in 100g icing sugar then mixed with enough warm water to make a spreadable, but not runny icing. Spread this over the cake and decorated with sugar flowers. I found that the cake rose well then slumped gracefully to just the right level giving a nice flat top to ice. The cake was moist, spongy and delicious (that’s what I was told anyway). Needless to say, we had a great time and I came home with an empty plate. Fantastic – sounds like the party was a lot of fun! I have a book that shows how to make the outdoor ovens but we’ll have to wait until we have a garden of our own, I think. Wow, you have to eat a lot of pizza to build your own pizza oven! Although I’m sure you can cook other stuff in there. Your cake looks good. Oooh, I’d love to try pizza in a home-made oven! Glad you found inspiration in the recipe and were able to successfully adapt it – I only made it up to use various things I had lying around the fridge so I was surprised it worked! Yours looks really good! I am so jealous of the pizza oven! The cake looks beautiful. I wish I had the pizza oven. The cake looks pretty and delicious! Hannah – a chocolate pizza sounds like something I should perhaps try. How cool to make your own oven. Janice – guess it would be good for bread and possibly cakes too? Perhaps it would also provide a good excuse to have a lot of parties – that’s what I’m hoping anyway. Chele – humm, tricky one that! C – well try using up your bits and pieces more often, this is a great cake – thank you. Pineapple Man – I want one too. It certainly made some great pizzas. Sushma – yes we did have fun and they were great tasting pizzas. Oxslip – they were good pizzas and the nettles actually made a really good addition. Not many were brave enough to try them though. Foodycat – yes you and me both. I want a pizza oven too! Cake looks great, good to know it will work with yoghurt as well as sour cream! Thanks Celia – yes I was really pleased that it worked so well with yogurt. Catherine – there were even two types of tomato sauce, one with garlic and one without. That sounds like a lovely cake, and of course you came home with an empty plate, did you expect otherwise? 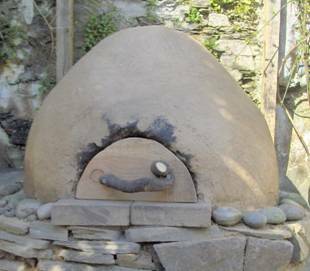 Mr OC and I have been talking about building our own oven in the garden a la Jamie Oliver for a couple of years now and do you know this summer might just be the summer we do it. I hope so and then we can look forward to pizza parties too! I love the pics of your friend building it. What fun! And the cake looks utterly glorious! Wow….I always dream of building my own oven. I can’t believe I’m seeing one….just amazing. Your cake looks very delicious. Kath – great to hear from you – you have been missed! Sounds like a plan – look forward to seeing your oven. A forkful – great fun and thanks. MaryMoh – thank you and don’t give up on your dreams. i love the simple decor on your cakes and combination with flowers, its gorgeous! Ananda – simple is my thing because I don’t have your patience.